It was not the best Championship-winning season ever but we still had the title. I promised the fans that I would beef up the defense next season and to reduce the number of draws we had this season. All in all, the top 5 league standings at the end of the 2000/01 season:- Arsenal(85), Chelsea(81), Liverpool(68), Aston Villa(61) and Manchester United(60). FA Cup glory awaits us at the Millennium Stadium in Cardiff, Wales. Wembley was going through a massive uplifting project, which saw the traditional venue being shifted here. 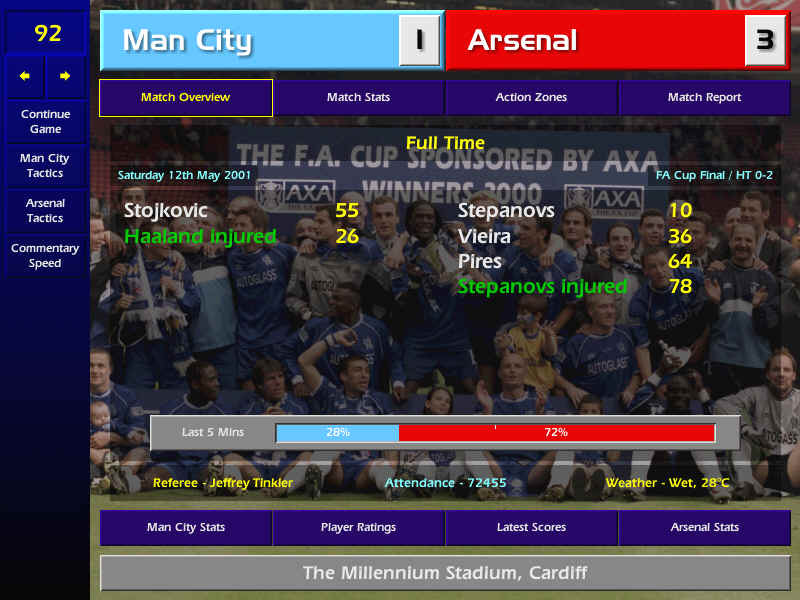 Manchester City was our opponent and according to past meetings, Arsenal held a slight upper hand. Arsenal has finally completed an unprecedented domestic treble. Neither the mighty Liverpool of the 70s and 80s nor the unstoppable Manchester United of the 90s had or could have achieved it. This called from an impromptu celebration around Highbury. Thousands of fans turned up to watch the team parading through the streets of North London. There was a massive sea of red and yellow all around the bus. Fans were chanting the names to the players and singing our championship-winning anthem. The celebration continued throughout the day. The next day, the squad was back to business. The European Cup Final match against AC Milan is just a few days away. A handful of the regulars were still in sick bay and I don't think I will risk them for fear of losing them next season. Aston Villa had shown us that British football is fast gaining recognition when they beat Real Zaragoza 3-0 in the UEFA Cup Final. I handpicked the best starting 11 possible under these dire conditions. All eyes were on me as I walk onto the hollowed turf at the Delle Alpi Stadium. Half of the stadium was decked out in red and white, while the other half in red and black. We've finally clinched it! We are now officially the best team in Europe. No more languishing in the shadows of our more illustrious counterparts. Arsenal has finally made it to the top and we intend to stay there for as long as possible. By winning the European Cup, we became the first British team to sweep all 3 European titles. We won the UEFA Cup way back in 1970 and the now-defunct Cup Winners Cup in 1994. We also joined the elite group of clubs that has completed the European treble, namely Juventus, Ajax Amsterdam, Bayern Munich and Barcelona. Our European record this season, having played 17 matches, we won 12, drew 4 and lost once. 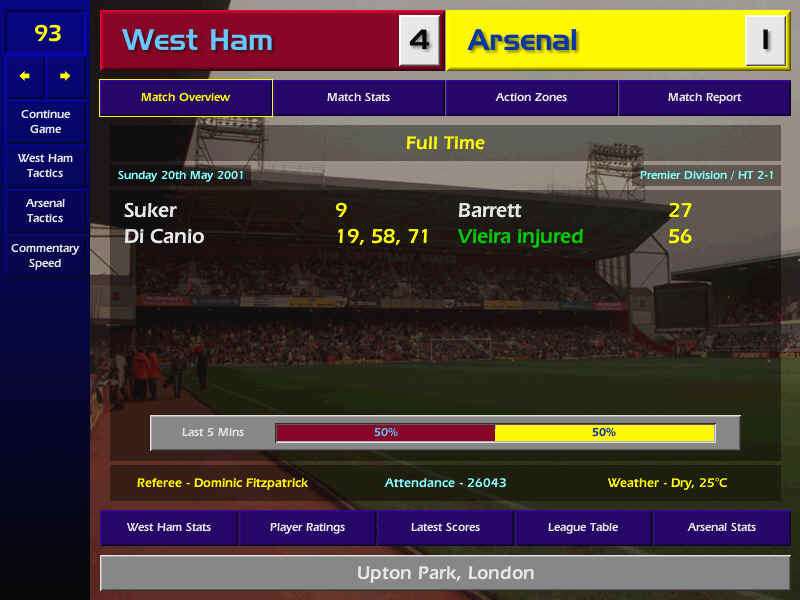 We scored 38 goals and gave away 14 in return.